Did you know that Al-Aqsa and The Dome of the Rock are two different mosques in Palestine? 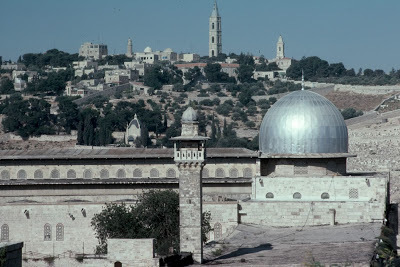 Why is it, that whenever Mosque Al-Aqsa is mentioned in the media, we see pictures of The Dome of the Rock Mosque? Driven by Zionist agenda, much of the perception of Al-Aqsa’s history, location, and importance in the Muslim tradition has been deeply undermined and misconstrued. In today’s world, it’s typical for people to mix-up Al-Aqsa - the second mosque built on Earth- for the Dome of the Rock. The world’s current understanding of Al-Aqsa poses a grave risk: it leaves the Mosque - and the land it sits on - vulnerable to potential acquisition from Israel. And if Al-Aqsa were to be destroyed: it would quickly fade from our memories, overshadowed by its more popular neighbor, The Dome of the Rock. We must act NOW to clear up this potentially hazardous misunderstanding, increase visitation to Al-Aqsa and fight to protect this historical and religious landmark. Become a supporter of Al-Aqsa and help preserve this piece of Muslim history for the world’s future generations. Learn more about the difference between Al-Aqsa and The Dome of the Rock, below: ave to carry out this duty even if we demonstrate and scream in the streets. We must help people understand the truth. Mosque Al-Aqsa, where Messenger Muhammad (PBUH) led the prayers for the other messengers. "سبحان الذي أسرى بعبده ليلا من المسجد الحرام إلى المسجد الأقصى الذي باركنا حوله لنريه من آياتنا ، إنه هـو السميـع البصيـر"
Now forward this to all, so as to inform them of the TRUTH. Masjid Al Aqsa was the second Masjid on earth. It was built 40 years after the Ka'ba in Makkah. The fundamentalist want to blow up and destroy Masjid Al Aqsa and replace it with a Jewish Temple.